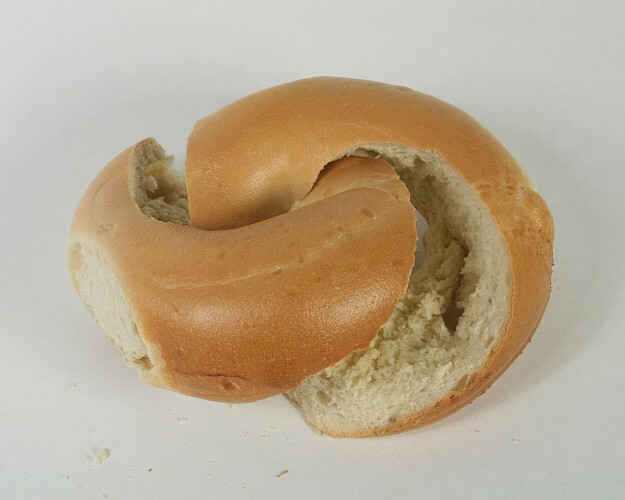 It is not hard to cut a bagel into two equal halves which are linked like two links of a chain. To start, you must visualize four key points. 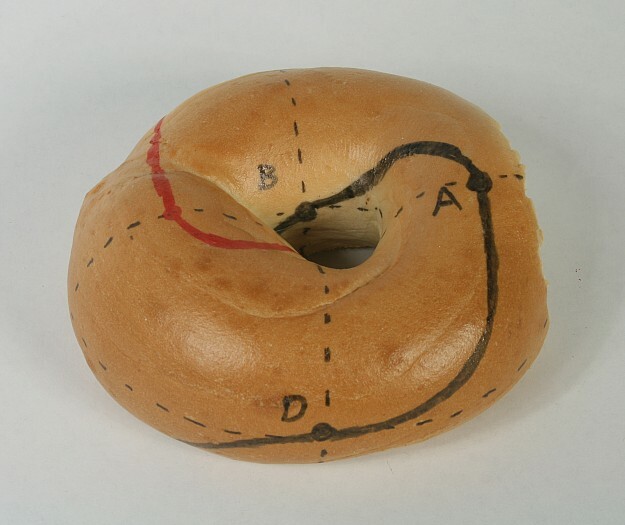 Center the bagel at the origin, circling the Z axis. A is the highest point above the +X axis. 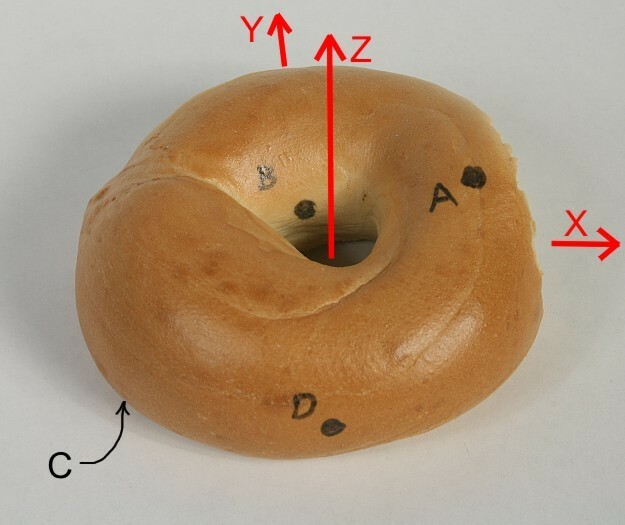 B is where the +Y axis enters the bagel. C is the lowest point below the -X axis. 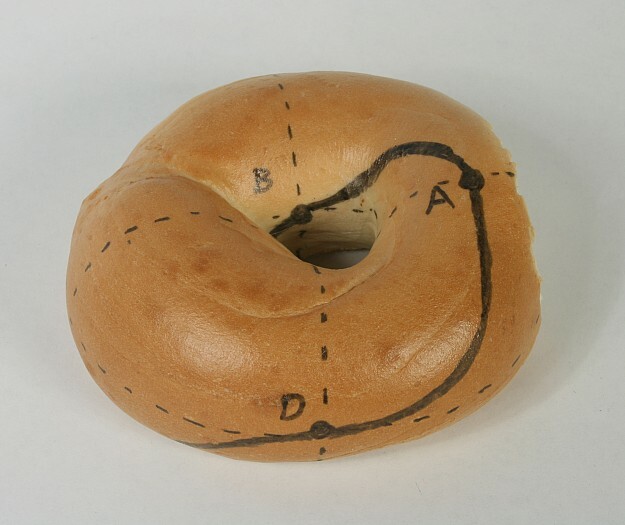 D is where the -Y axis exits the bagel. and the points. 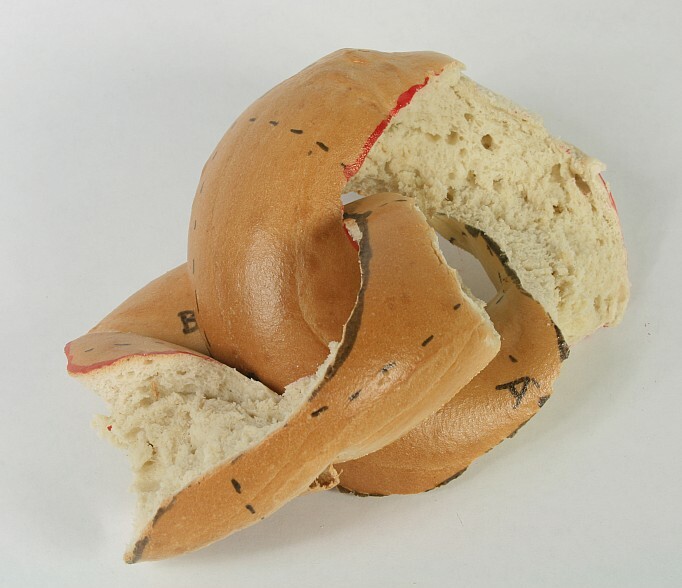 You don’t need to actually write on the bagel to cut it properly. The line ABCDA, which goes smoothly through all four key points, is the cut line. 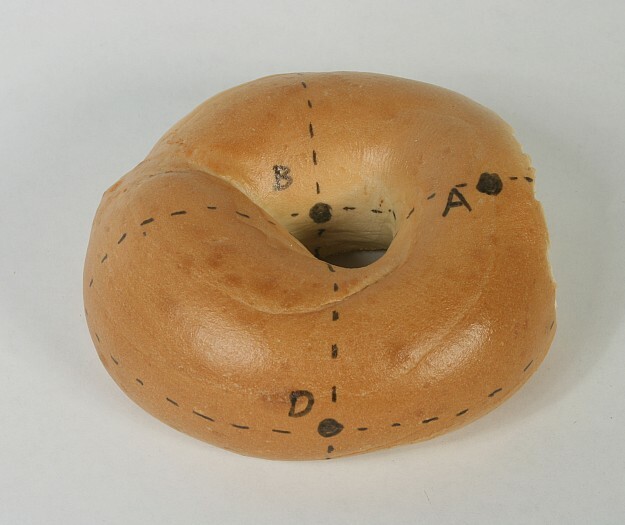 As it goes 360 degrees around the Z axis, it also goes 360 degrees around the bagel. The red line is like the black line but is rotated 180 degrees (around Z or through the hole). An ideal knife could enter on the black line and come out exactly opposite, on the red line. But in practice, it is easier to cut in halfway on both the black line and the red line. The cutting surface is a two-twist Mobius strip; it has two sides, one for each half. 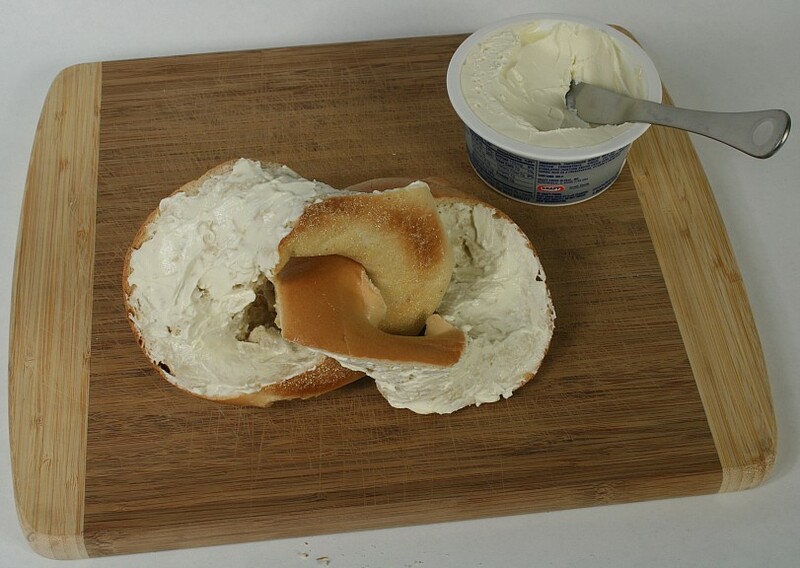 not need to draw on the bagel. Here the two parts are pulled slightly apart. If your cut is neat, the two halves are congruent. They are of the same handedness. minute or so, otherwise some parts will cook much more than others, as shown in this half. the intellectual stimulation, you get more cream cheese, because there is slightly more surface area. Topology problem: Modify the cut so the cutting surface is a one-twist Mobius strip. 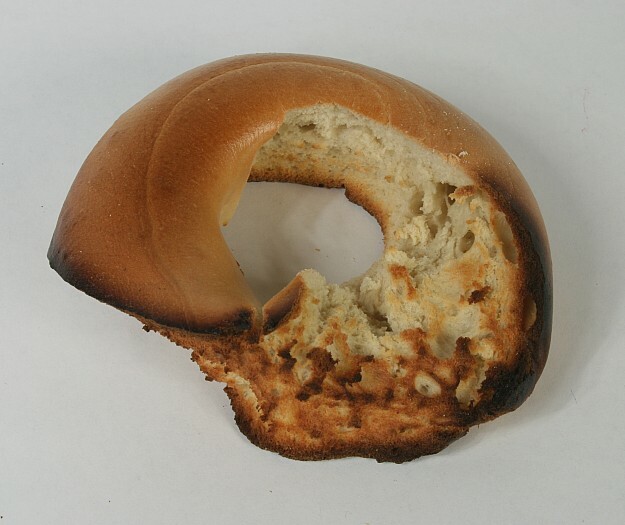 to the surface area of the usual planar bagel slice? Note: I have had my students do this activity in my Computers and Sculpture class. It is very successful if the students work in pairs, with two bagels per team. For the first bagel, I have them draw the indicated lines with a “sharpie”. Then they can do the second bagel without the lines. (We omit the schmear of cream cheese.) After doing this, one can better appreciate the stone carving of Keizo Ushio, who makes analogous cuts in granite to produce monumental sculpture. Addendum: I made a video showing how to do this. How utterly pointless and utterly wonderful.